Bob Dylan released Tombstone Blues, from which the above title comes, in the same year I started my maths degree course. The Mathematics Department divided into two distinct cultural camps: pure and applied. The pure mathematicians were snobs. They looked down on their lesser “applied” colleagues, who got their hands dirty by supplying useful tools for scientists, architects, meteorologists and all sorts of other people in the “real” world. To the purists, the quest was for “beauty” and the term was often used synonymously with “uselessness”: the more useless, the more beautiful. One small part of my course concerned number theory and a subset of this dealt with prime numbers and modular arithmetic. (Links are provided for anyone who is curious or sad enough to want to know more; otherwise, read on…) Frankly, I found this part of the course a bit boring and – dare I say? – pointless. However, its enthusiasts pointed out how elegant, how beautiful and, above all, how useless it all was. Fast forward thirty years. My son was now a student, reading computer science. He told me about an assignment he had to do, concerning encryption on the internet. The purpose of the assignment was to find the most efficient way to write computer code which would encrypt and decrypt data to keep it secure over the web. These were the days before superfast broadband, and speed of transmission was all-important. Imagine my surprise when I discovered that underlying the encryption systems was the same useless maths I had learnt thirty years earlier! My point is this. In the days since I was a student, the debate around education and its purpose has shifted more and more to a purely economic one. The talk is all about training the minds of the next generation to maximize their own job prospects and for the greater good of “UK plc”. Whatever happened to the idea of knowledge, insight and even appreciation of beauty as moral goods in their own right? So, the next time you stand in awe at a beautiful sight, when someone tells you some strange, new fact that doesn’t fit – that makes you think: “hang on a minute” – or, more basically, the next time you’re doing some online shopping, just spare a thought and raise a cheer to all that “useless and pointless knowledge”! Her name was Vicky, and I thought she was gorgeous! I was a shy 13 year old; she was the vicar’s daughter. My sisters sang in the local church choir. We weren’t at all religious as a family – it was more of a social thing: meet up with friends, have a laugh at rehearsals, sing a few hymns, that sort of thing. There was talk in the group about going to confirmation classes. Rumour had it that Vicky was attending. This is a sad tale of those early pangs of what we, rather drily, call sexual attraction. Those awkward, angst-driven days with strange yearning feelings, but without the social skills or experience to know what to do. Confirmation classes: that sounded tempting. Lots of opportunities to sit in the same room as Vicky – perhaps a glance, a smile, and then what? There was one problem: this religion business. The school I went to was run on traditional lines: daily assemblies, two hymns, a bible reading. I was beginning to think that this didn’t make sense: that the belief in something or someone “out there” was not for me. I already had the evidence to bust the two main myths that parents tell children. As an older brother, I was in on the secret that the tooth fairy was really my mum. (Incidentally, she was also the fairy who left sixpences under turned-up eggshells on the kitchen window sill, for no other reason than we’d had boiled egg for tea.) As for Father Christmas, I can still remember the Christmas Eve when, pretending to be asleep, I saw my dad come into the bedroom, torch in hand, to place the stockings and Christmas presents at the foot of the bed. There was no such evidence proving the non-existence of God, but still I felt uneasy. If I went along with the confirmation classes, I would be doing it for an ulterior motive. Worse, I would be a hypocrite. As you can guess, I didn’t go, and Vicky never found out about my unrequited love. Or at least, that’s the way I tell myself the story went. Truth to tell, it was probably my shyness that did it for Vicky and me. But that’s how I can remember exactly how old I was when I first had serious doubts about God. Human Eyes is proud to launch a new service today: bite-sized tips for students busy revising for their science exams. It’s called Silly Science and is just one mouse click away. Further contributions to help students in these hard-pressed times would be most welcome! 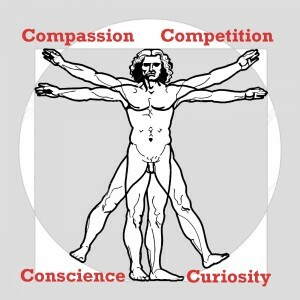 Being Human: It’s Easy as C, C, E! to some very basic concepts – three, in fact. Let me first put this into some kind of context. Roughly speaking, human beings, our species homo sapiens, have been around for 200,000 years, with proto-humans for roughly 2 million. Over that time, we have spread from Africa over the whole planet (if you count the base station at the South Pole). And in that time, we have clearly become the “top” species in terms of our impact on life on Earth. What is it that makes us so special? Well, clearly the development of language and “higher order” reasoning are often mentioned. Also, it’s often said that we are the only species to be aware of our mortality, but how we can know this I’m not sure! This is all very well, but what, at its most basic, do we mean when we say someone “is only human”? Think of it in terms of a simple triangular diagram: Let’s explore each of these in turn. Curiosity, or inquisitiveness, seems the most obvious human characteristic, so much so that it hardly needs explaining. Think of the look of wonder in a small baby’s eyes at it looks at a brightly coloured toy or rattle. Or, perhaps, think of the constant stream of questions from a back-seat four year old when you’re trying to navigate heavy traffic in a strange town! All too often as we get older, that sense of joy and wonder in discovering new things seems to fade away. Some of us slide slowly into a safe world of fixed views and prejudices, with our ideas confirmed by a narrow group of friends and an equally narrow range of other sources of information. And yet, others manage to keep that child-like sense of questioning and searching for something new, right up to the day they die. To me, curiosity is a kind of “umbrella” characteristic which informs and energizes the other two (which is why I put it at the top of the triangle). Moving clockwise, we come to competition, perhaps better described as our competitive spirit. It’s the drive that makes us want to be winners, to make life better for ourselves and our loved ones. From our hunter-gatherer ancestors, competitiveness is associated with masculinity, and echoes of the role division between men and women from our earlier times persist today. Competition is much loved by politicians on the right. For me, without competition, human beings, fewer in number, would still be contentedly eating nuts and berries in East Africa and what we call civilization would never have developed. Last, and by no means least, we come to empathy: the ability to imagine something from another person’s point of view. It’s the more compassionate, nurturing side of humanity, leading to ideas of fair play, altruism and group solidarity. Again, from primitive times, we tend to see empathy as feminine, not least because of the child-rearing role of women in traditional societies. Empathy and its derivatives tend to be the concern of politicians of the left. Without empathy, I believe, we simply wouldn’t be here to discuss this – sometime over the past quarter of a million years, our unrestrained, aggressive selves would have wiped us off the face of the planet! So there you have it: humanity summed up in just three words. 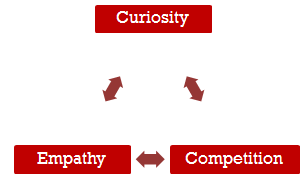 I plan to use this framework to discuss some future topics: watch this space! * Yes, I know you can’t see a radio programme! With just one year to go before the 2020 General Election, Guardian journalists review the achievements of the Government in the last four years. Following phase two of austerity measures introduced after the 2015 general election, the UK economy returned to recession in Q4 2015. In a rare show of consensus, economists agreed that the Chancellor had simply repeated the same mistakes from five years earlier. Thanks to effective news management from Tory-supporting newspapers, public opinion swiftly blamed the new economic crisis on a combination of the EU, immigrants, the poor and the mess left by Labour in 2010. David Cameron began well at the start of the promised renegotiations of the UK’s relationship with the EU, by promising to “look after Britain’s interests” whilst “keeping the UK at the heart of Europe”. However, his negotiating style quickly returned to form: lecturing to all foreigners and getting very red in the face when they disagreed with him. His potentially closest allies in Europe quickly lost patience and any sympathy for the UK’s position. This led to a complete breakdown in negotiations. This forced Cameron to throw his full weight behind the “out” campaign in the late 2016 referendum. A similar negotiating style on devolution terms for Scotland led to the Scots unilaterally deciding to hold a second referendum on leaving the UK: this time, the vote was 63% “yes”. Cameron initially refused to recognise the vote as legitimate, but, as a result of the small Conservative majority, the threat of a revolt from ten of his “glad to see the back of them” backbench MPs forced him to accede to the Scots’ demands. On 1st January 2018, the UK left the EU and Scotland left the UK on 24th June the same year. Nicola Sturgeon had successfully negotiated an interim arrangement whereby Scotland kept all the rights and obligations of EU membership between these two dates. Initially, the renewed offer by the Chancellor of devolved powers for northern cities was met with a warm reception. When an observant northern city councillor revealed that the “small print” in the deal meant that the “powerhouse” proposal was no more than a smokescreen for further cuts in Whitehall funding for local government, the atmosphere quickly soured. A Treasury spokesperson attempted to justify the cuts using the argument that the entrepreneurial spirit “set free” by the proposals would mean northern cities would need less “subsidy” from the south. Critics soon compared this assertion with the argument used for the, now twice failed, claims in 2010 and 2015 that cuts to public spending would help get the economy moving. A small group of Labour councillors in Manchester led a campaign “the Tories don’t care about us up north” which quickly took hold of public opinion there. Demonstrations, followed by rioting akin to that seen in the Thatcher years over the Scottish poll tax “experiment”, soon got out of hand. In the aftermath of the riots, the “offer” of devolved government was withdrawn by Westminster. Negotiations between Holyrood and Westminster proved tough for Cameron, particularly after the northern riots. Eventually, he was forced to concede that the former border between England and Scotland be moved roughly 250 miles south, with some detailed boundary issues still to be settled at the time of writing. Two significant enclaves were agreed, one north and one south of the new border, to allow for exceptional cases. In the north, Cheshire opted to remain in the former England, and a short stretch of the M6 was appropriated as a “safe passage” for residents of Cheshire to travel “without hindrance” to the southern mainland. In the south, following a remarkable campaign by a group of leading academics, hi-tech business leaders worried about loss of EU markets, students and party activists, Cambridge staged its own referendum in which they overwhelmingly voted to join Scotland. A section of the A1 and A14 was similarly reserved for Cambridge residents to travel freely north. As a precaution, the security barrier on the A1 was built to a greater height and with additional security features at the Grantham bypass. The tabloids quickly dubbed the security fence the “Farage Barrage” and the Cheshire enclave “Dacre’s Acres”. The latter was in honour of the leader of the most consistent misinformation campaign for the Tories and as a topical reference to the reintroduction, in the south, of capital punishment – for anyone found using metric measurements. Welcoming Cambridge and northern England to the Holyrood parliament, Sturgeon stated that Scotland would be the heart, Cambridge the brains and northern England really would be the manufacturing powerhouse of the newly independent country. Three months before the start of border controls between the new “Caledonia” and “Cameronia”, residents of Lincolnshire objected to the inconvenience of having the A1 as a barrier to the shortest routes to other parts of England. An informal local plebiscite led to Lincolnshire opting to join the new Free State of Greater Clacton and thereby opting out of both their new neighbours. In his first move following partition, Ian Duncan Smith successfully negotiated an exception to the total closure of borders between Greater Clacton and the rest of the world. This was to sub-contract all the work of Job Centre Plus offices – now re-branded Work Makes Free – to new processing centres in Lincolnshire. To overcome the problems of very poor transport links in the area, all roads were designated one-way only (inbound). Benefit claimants will now need to make their way as best they can to the new centres. Cameronia’s record – and rising – trade deficit was reduced temporarily by the loss of two key ports: Felixtowe, now permanently closed, and Liverpool, now in Caledonia. Work started to revive the fortunes of the port of Bristol. This was helped by the small-scale reintroduction of the slave trade, otherwise known as “tier 2 immigrants” in the new two-tier immigration points system. Tier 1 immigrants, who are allowed unrestricted rights to enter and leave Cameronia, are now defined as those with an annual income of at least £1.5 million, or capital of £100 million. The national boundary change forced Aston Villa Football Club to relocate to West Ham at the start of the 2018-19 season. Chaos on the A14 as academics from other Universities in the south try to reach Cambridge before the border closes. TfL re-brands the Oyster Card: now called the Shark Card. All card purchasers must show proof of income of at least £150,000p.a. The poor must use the (reduced) bus services only. With the London Congestion Charge abolished for company cars, bus journeys are slower. Health experts have expressed fears of a serious health crisis, with poor workers in London now averaging less than 3hrs sleep a night, in order to get to work on time. In an unusual case of nominative determinism, the operators of the newly-opened Crossrail service state that all users must carry a copy of the Daily Mail or Daily Telegraph when travelling. Commuters are required to look up from their newspapers at frequent intervals and make disapproving tutting sounds to show how cross they are – about benefit scroungers, poor people, single mothers, etc. Osborne announces that completion of the HS2 rail link is to be brought forward and the route modified, with the northern terminus at Tatton. Richard Branson said he was “shocked” to discover that Virgin Trains is the surprise winner of the Islamic State Railways contract. The Freedom of Information Act is replaced by a Freedom of Misinformation Act, dubbed the “Right to Lie”. This grants government ministers and newspapers (except those not owned by tax-avoiding multimillionaires) full legal indemnity when stating any untruths . Ministers quietly slipped in a clause allowing the Prince of Wales to place black spiders on opposition benches in the House of Commons, to disrupt speeches. A group of leading academics and economists presented a controversial report to the European Parliament about the effects of deregulation of financial services since the 1980s. The report concluded that all new financial products and services introduced since then were essentially giant Ponzi schemes designed to transfer wealth from middle- and low-income households to the super-rich and were of negative social value. The EU parliament voted by a 2 to 1 majority to ban these new practices within the EU within a 3-year period. After fierce negotiations, the EU Council of Ministers reluctantly agreed parliament’s recommendations. Cameron steadfastly refused to make any changes to City practices following EU pressure. As a result of this refusal and Cameronia’s opting out of European Human Rights regulations, EU trade sanctions were imposed from 1st January 2019. Estimated job losses from these sanctions and the relocation of many multinationals following Brexit vary between 2 and 5 million. A reluctant President Clinton eventually agrees to reform Wall Street slowly – arguing to her domestic objectors that the USA’s much broader economic base than former UK means that Americans will benefit in the longer term. Following the abolition of all employment laws, companies increasingly introduce “registration fees” – typically £50 to £75 a week – for workers to retain the privilege of zero hours contracts. This, in turn, sparks a rapid increase in “no gain no pain” lawyers typically charging non-refundable fees of £250 to workers disadvantaged by the changes. Social workers report that sexual abuse within families has risen 25% following the limitation of housing benefit to one bedroom only, regardless of family size. The Archbishop of Canterbury announced the discovery of a rare early scroll casting new light on the scriptures. The archbishop stated that one of Jesus’ most famous sayings was misquoted and should now read: “the poor shall inhabit the earth” (see also Lincolnshire above). In an unusual example of government interference in the workings of the free market, a Customer Loyalty Penalty act was introduced, to demonstrate that competition is always the best way to protect consumer interests. The Act decrees that all utility and insurance companies must impose a minimum 10% plus inflation price increase for any consumer too lazy to switch providers on renewal. Experts say this will make very little difference, as it merely formalizes current practice. George Osborne finally announces what many had suspected: that his part-time job as Chancellor of the Exchequer is too disruptive of his main role as chief political strategist for the Tory party. The job will be devolved to the “big four” accountancy firms Deloitte, PwC, Ernst and Young and KPMG. Contracts will be awarded and managed by newly-created Criminal Commissioning Groups run by convicted fraudsters. MPs have voted to award themselves an annual pay rise of 25% for each year of this parliament. Ministers state that money will be saved overall by the introduction of a disloyalty penalty. An MP’s salary will be permanently reduced by 10% each time he or she votes against the government. A threatened last-minute revolt by the few remaining Tory “awkward squad” backbenchers was headed off by the creation of an appeal panel to consider exceptions to the penalty rule. The panel members will be George Osborne, Michael Gove and Chris Grayling. In an attempt to distract from the breakup of the United Kingdom, the Conservative Party has formally renamed itself the “Conservative United New Tories”. A new kitchen tax will be applied to all private dwellings with more than one kitchen. Tory party donors, government ministers and royal family members are exempt. The new Mental Health Act defines proponents of Health & Safety rules as having “gone mad”. A small group of Oxford academics who chose not to move to Cambridge have been commissioned by the government to produce a New Oxford Dictionary: the Rightspeak Dictionary. What does it mean to be human? Much of the public debate in politics and other areas of life seem to cover the same narrow range of views about how we run a modern, prosperous western country like 21st century Britain. Too often it seems that human beings are reduced to the status of consumers, or economic units in an impersonalized world. People are increasingly defined by what they earn, what they consume and what economic value – or burden – they are to society. Inequalities of wealth and income are increasing here and over the world, as capital flows freely and the free movement of people is increasingly confined to “the skilled”. I want to use this blog to explore the underlying values behind this world view – and to challenge them. We need to reconsider some very basic assumptions about the way we view each other – or at least encouraged to do so. My posts will be a mixture of serious and less so, some just downright silly, for fun. Life’s too short to be serious all the time. My immediately next post is a spoof news item from 2019, reviewing four years of achievements of the Cameron Government. I wrote it as self-therapy two days after the election result was known. I hope it will bring some wry amusement. 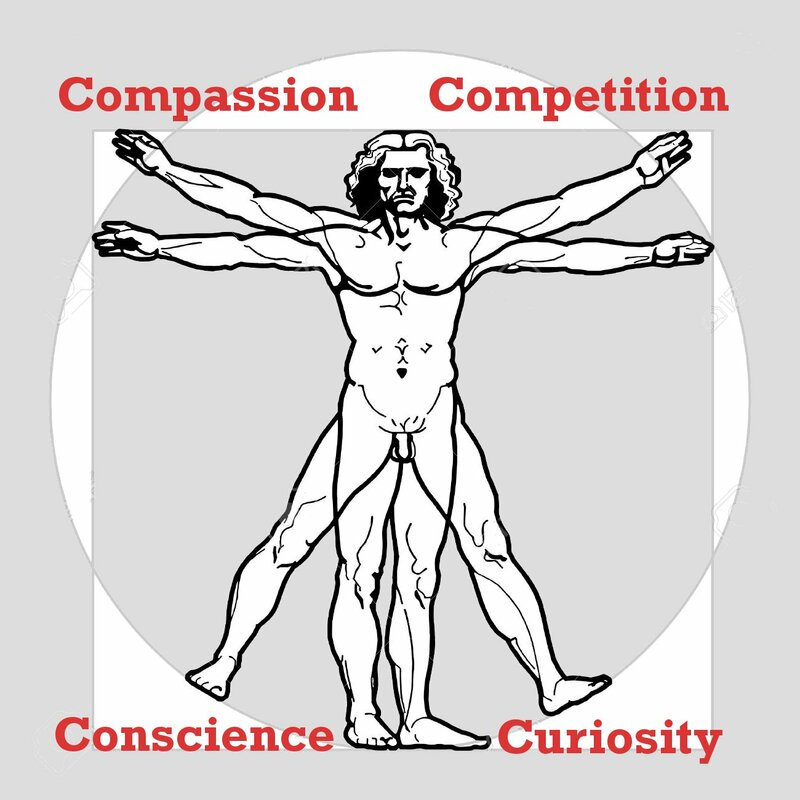 Planned future posts include a look at the most basic elements of being human, a critique on free market economics, education, religion and humanism. Some views will no doubt be controversial, others perhaps more universally understood. The bare bones only of this site exist so far: a short page about the site and the Rightspeak Dictionary – check it out! – which I hope will amuse and prompt lots of suggestions for additional words and definitions. My thanks, dear reader, for getting this far. I will aim to make this blog a meandering journey around 21st century Britain. I plan to have some fun doing it – I hope you will come along and enjoy the ride!